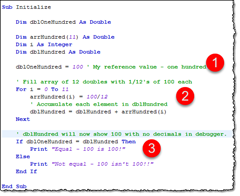 Proud Programmers Blog :: Classic LotusScript: When 100.0 isn&apos;t 100.0 anymore?! Classic LotusScript: When 100.0 isn&apos;t 100.0 anymore?! Today I had to debug some old code, and when doing so I stumbled over something which I found strange. I put the above code in a test-agent. Marked by 2, I fill my array of 12 doubles with 1/12 of 100 each. Marked by 3, I compare the two variables dblOneHundred and dblHundred. If you want to see more, both on my take for an explanation, the workarounds including code to try out, please continue to read below. Since LotusScript deems these two numbers different, there must be a difference between the two numbers, at least as LotusScript sees it. My guess is that it has to do with decimal precession in floating point numbers combined with some issue in either on how doubles are stored or when they are compared. When I force the result of the division 100/12 into each element in my array, the number is 8.33333… with an indefinite number of decimals. According to the LotusScript Help, the Double datatype is a 8-byte floating point value meaning that it can have a huge number of decimals – at least behind the scenes. This works and LotusScript says the numbers are equal! Just for the fun of it, how many decimals can we use before the comparison fails? 14 decimals is the answer. Try the following in your OS calculator; Multiply 12 by 8.33 and you get 99.96. Do the same with 8.333333333 (9 decimals) and you get 99,999999996. First with 15 decimals we get 100. Thus I further guess that LotusScript differs with the number of decimals in the implementation of CDbl compared with the compare-operation (=). If I “overdo” it a little manually, you could say that LotusScript perhaps has stored the month-values with 15 decimals precision, and when it compares the doubles, it only use 14 decimals – or vise versa. Yes!! The problem is first and foremost language consistency. If you you simply can convert the values to text, and then perform an equal comparison, it means that the CStr-function in LotusScript do some sort of “discard the way-off decimals” and it sees the value 100 exactly as that string-wise (and just as the Debugger by the way). 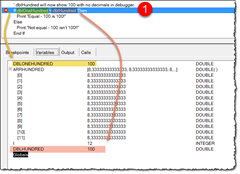 When you compare two doubles like I have shown, and you can’t see the difference in the debugger, neither should the comparison-operator. In a sense it feels like LotusScript utilize some super-precision in one place, while disregarding it in other places. The impact of this is that I have to find and safeguard my code in a bunch of places.
' 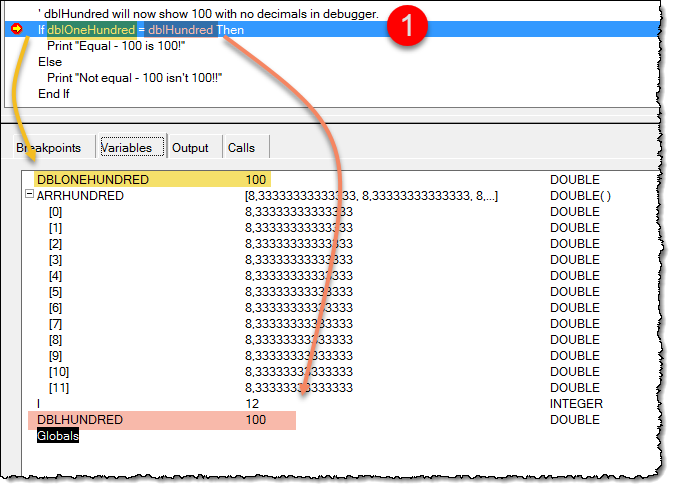 dblHundred will now show 100 with no decimals in debugger. Print "Equal - 100 is 100!" Print "Not equal - 100 isn't 100!!" 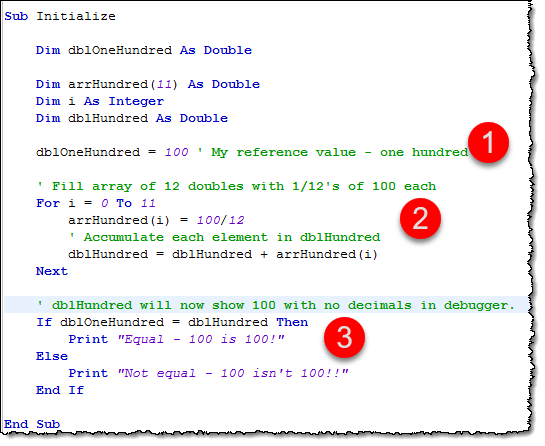 Print "Testing comparison with " & CStr(i) & " decimals"
Print "Not equal - 100 isn't 100!! " 1 - The currency data type can be used to avoid this problem. The currency data type is fixed point (as opposed to floating point) but only goes to four decimal places. In many cases we use the double when currency will do or is even better. 2 - On my iPhone 12 x 8.33333333 = 00 ......oh dear..
3 - Glen - Thanks for your hint about currency datatype. That might be the easiest transformation, since we can track Double-datatypes and switch out CDbl with CCur. Thanks again! 4 - Don - woooa.....t!!! I tried the same on my default iOS calculator, and indeed; The answer is 00 (whatever that means ....0 should suffice I'd think ....). On my PCalc-app (rel 3.6.3) I get 99,999999996. Obviously we have scratched something that isn't good It reminds me of some news-case some years ago where a university had problems with an Excel version due to massive calculation, and problems along these lines. I can't seem to find the exact case, but I remember that many were thinking along the lines "he he, what a bummer, Excel, such a play-toy coming to real math ...".... Turns out they are not alone then, both Notes and iOS ... "what a bummer, such play-toys coming to real math, ha ha ha!". And also reminds me of "And why beholdest thou the mote that is in thy brother's eye, but considerest not the beam that is in thine own eye?"